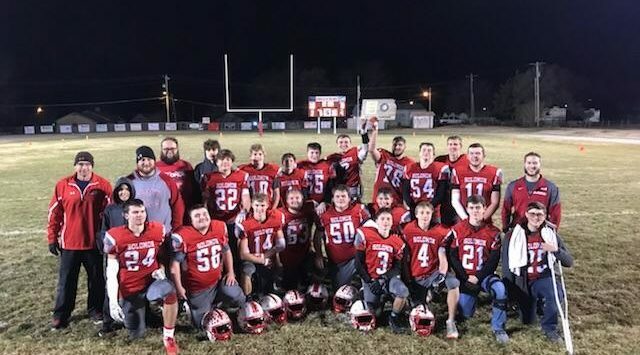 The Solomon Gorillas made history Friday night as they defeated Canton-Galva 28-12 to advance to the state championship game for the first time in school history. Solomon will play in the 8-Man Division I State Championship game Saturday, November 24, in Newton at 3 PM. The Gorillas will either play Central Plains (11-0) or St. Francis (11-0) , who play each other Saturday at 2:30 in Claflin. Solomon used their defense for the second straight week to fuel their victory. Canton-Galva entered the game averaging 56 points a game and 370 yards of total offense. The Gorillas shut the Eagles down in their second match-up of the season. Canton-Galva handed Solomon their only loss 38-20 on October 12, at Canton-Galva. This time around it was a different story as the Eagles only managed 240 yards of offense and had five turnovers. Junior Quarterback, Landon Everett, entered the game with nearly 2,800 yards of total offense and 55 touchdowns. He struggled against against the Gorillas as he rushed for 45 yards and completed just 7-14 passes for 127 yards, 2 touchdowns and 3 interceptions. He had only 2 interceptions in his previous 11 games. Everett was picked off twice by Senior, Braden Neilson, Neilson has five interceptions over the last two games and a fumble recovery. Solomon, as a defensive unit, has forced 11 turnovers over the last two weeks and given up just 18 points. Solomon fell behind early as Canton-Galva scored on their first series of the game on an Everett to Freshman, Tyson Struber 71 yard touchdown pass play to go up 6-0 with 11:07 to play in the first quarter. The Gorilla offense got on the board in the second quarter on a 10 yard run by Senior, Logan Krause. Neilson would add the 2-point conversion to give Solomon an 8-6 lead with 3:37 to play in the first half. The Gorillas would then put together a scoring drive after Neilson’s second straight interception with :55 seconds to go in the half. Solomon used a reverse flea flicker on their second touchdown. Neilson handed to Senior, Jobe Fowles, who gave it to Krause, who tossed it back to Neilson, who then connected with Senior, Tyler Marfise on an 18 yard touchdown pass play on the final play of the first half, to give the Gorillas a 14-6 lead at the intermission. The Gorillas went three and out on the opening possession of the second half and were forced to punt. Neilson, was brilliant as the punter all night. He pinned the Eagles back at their own 5 yard line, where they would fumble. Krause recovered the football for the Gorillas, Fowles scored three plays later and added the 2-point conversion to push the Solomon lead to 22-6 with 7:26 left in the third quarter. Neilson, put the game away on 4th and 1 at the Canton-Galva 26 yard line on a touchdown run to extend the lead to 28-6 with 4:13 left. He racked up 111 yards rushing and 49 yards passing in the victory. The Eagles would get one last touchdown, on a 7 yard pass play from Everett to Struber with 2:58 left to make the final 28-12. The Gorillas improved to 11-1 with the victory and unofficially totaled 286 yards, with most of their offense coming on the ground. Fowles totaled 90 yards on 21 carries, and Krause, who leads the team in rushing finished with 36 yards on 15 carries. Canton-Galva ended their season at 10-2, their only other loss came in week 1 at Little River. The Eagles will return their entire team next season as they did not field a single senior in their lineup.